Aiming at prevailing the patent system for bringing the scientific and technological progress to the world, we set up Kobashi Patent Office in September 1960. At that time, industries in Japan were experiencing high economic growth with no real precedent in history. This year, we are celebrating our 50th anniversary in business. Nowadays, with an increasing borderlessness of the world, Intellectual Property Strategy is necessary for enterprises both at home and abroad to succeed in keen market competition. By combining the young energetic attorneys and technical experts with our 50 years of professional practices, we devote our effort to contribute to the enterprises both at home and abroad through IP strategy from patent application till the management of Intellectual Property. 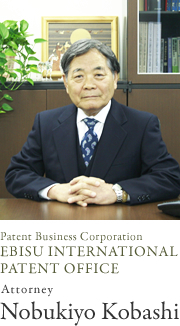 Registered as Patent Attorney in 1960, Mr. Kobashi has conducted professional service for 50 years. Other than patent applications, our business outline also includes providing legal advice on infringement of right, settlement of dispute relating to the infringement of right, and so on. Agricultural machines, vehicles, pipelines are Mr. Kobashi’s especially strong technical fields. Mr. Kobashi, as a patent attorney, hopes to contribute further to our clients by taking advantage of his abundant experience, reinforcing the consulting service on IP Strategy in the years ahead.